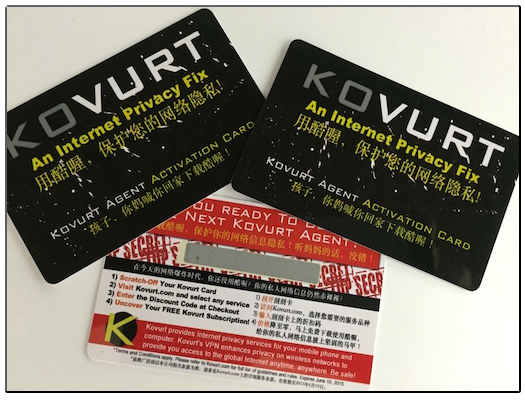 Use Your Kovurt Agent Activation Card Soon! Did you hold a Kovurt Agent Activation Card with a red stripe on the back? Scratch-off the back of the card and enlist quickly before these cards expire on June 10, 2015! Your card entitles you to a free trial of Kovurt’s fantastic privacy service, so be sure to use your card before the deadline hits next week! We will again distribute special free activation cards to our partners and distributors in a few weeks, so more of you can enjoy Kovurt. Become a Kovurt Agent at Kovurt.com and gain privacy on wireless networks. Safeguard yourself on your mobile phone, tablet, or laptop with Kovurt!